If one good arcade racer deserves another, then the Asphalt series by Gameloft has been good for quite some time. Believe it or not, we’re up to Asphalt 9: Legends (Free), which once again gives you the chance to drive a bunch of pretty awesome real world cars you normally wouldn’t be able to afford in both solo and multiplayer races that really need to be seen to be believed. Seriously, this is one gorgeous racer, and the developers knocked it out of the park in terms of the visuals for both the cars and the tracks. Ever fancy racing through the outskirts of a tornado or leaping between segments of track during what appears to be an active earthquake? Yeah, you’ll be doing that here. So given the fact that the game is free to download and you’re likely to be hearing a ton about it if you haven’t already tried it yourself, let’s get into what all the fuss is about and how you can make a go of the racing career you never knew you wanted while spending as little dough as possible. Asphalt 9 makes no bones about the fact that the driving you’re doing bears no resemblance to real life, in case the hints we dropped about the tornado and the earthquake weren’t clear on that score. This is high energy, full bore arcade racing with an emphasis on tons of boost and outrageous jumps and other tricks. The first thing you’ll need to orient yourself with is the nitro button, because you’ll be using it often. Your nitro meter is at the top of the screen, and you fill it by running into bottles, doing tricks (including jumps or 360) or by using the button on the opposite side of the screen to drift through turns, which conveniently is also the fastest way through many of them. You can hit nitro any time you have any meter and get a speed boost until the meter runs down, but you can get more speed by timing a second tap for when the meter enters a blue area. Tapping when the meter is purple creates a nitro shockwave, which is the fastest boost possible but also burns through your meter the quickest. Racing in Asphalt 9 is also full contact, in the sense that you can physically knock other competitors out of the race briefly (they respawn pretty quickly) to get an advantage. Simply double-tap the drift button while in a nitro boost and if you time it right, you’ll do a 360 that can knock out other cars. You can also score a KO if you time a boost just right from right behind it, but of course you need to be aware of others doing the same to you, particularly in multiplayer races. Though the game supports both tilt and tap steering control schemes, one new and interesting feature this time out is called TouchDrive. With TouchDrive activated, the car essentially drives itself in terms of acceleration and steering, but you still need to man the drift and nitro buttons. On top of that, icons at the top of the screen will appear and tell you what track features are coming up in the next few seconds, including nitro bottles, jump ramps and shortcuts. By swiping to one side or the other, you tell the AI to head for that feature, making it a true auto-drive/full control hybrid. TouchDrive isn’t infallible, as you can still run off the road or miss long jumps if your timing is off, and it’s not going to be a match for skilled competitors in multiplayer. But it is very usable in solo modes, a big boon for beginners and a way to play and accomplish some things without too much effort on your part. 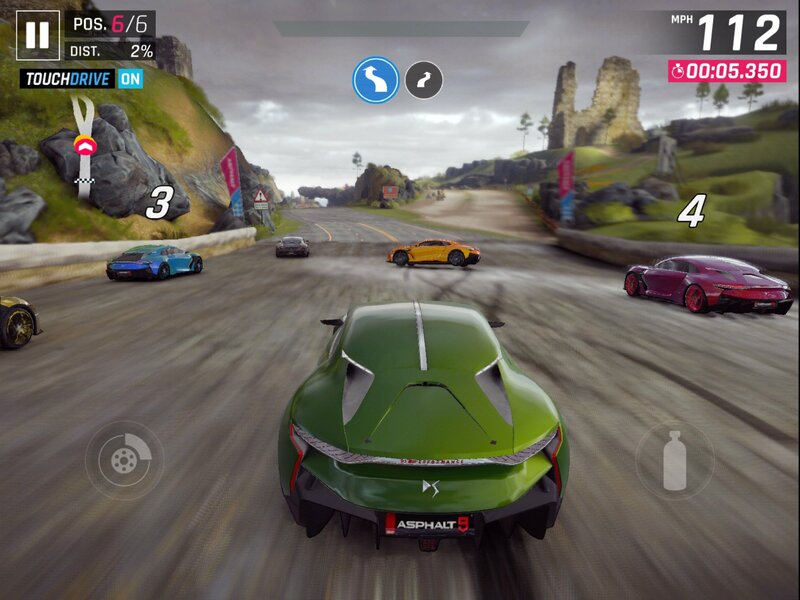 Along with TouchDrive, perhaps the biggest change for Asphalt veterans is how you acquire cars in Asphalt 9. 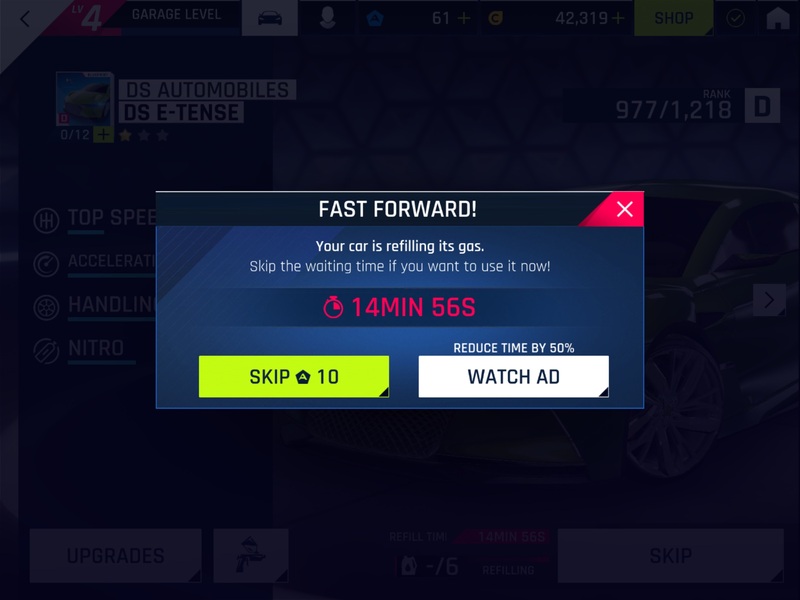 Forget about saving up money to buy them, as the key to unlocking new cars and ranking up the ones you have is now in the hands of a card system. Car cards are called blueprints, and you’ll need different amounts of them to unlock and then to rank up each car. There are positives and negatives to it: The undeniable randomness of the gacha-esque mechanic means you won’t always be working on the cars you might want most, but it also adds a feeling of progression toward multiple cars at any given time that some players will definitely appreciate. Take full advantage of My Career mode: The main solo mode in Asphalt 9 will yield you car blueprints on a regular basis. Be sure to take note of the goals for each race, as some levels have multiple tasks to complete before you receive the blueprints they are offering. Not all cars’ blueprints are in My Career, but you’ll find a nice variety from several different tiers. And the mode is huge, too, enough to occupy you for weeks even if you play like a fiend. Participate in Daily Events: Once you progress enough to access them, the Daily Events tab is something you’ll definitely want to visit … well, daily. Each weekday has an event with blueprints up for grabs from a different car class, and on weekends, you’ll find them for all classes. The Daily Car Loot is especially worth playing every day, as you race solo against the clock for the chance to earn blueprints from different classes depending on what you drive in it. Join a Club and work with other players on milestones: Clubs are the Asphalt term for guilds, and you’ll want to join one even if you aren’t into social interaction in your mobile games. Over the course of each Club season, every member earns reputation points for any race they enter, with the Club’s total reputation unlocking rewards at certain milestones. Every few milestones will grant blueprints for an epic upper tier car, so there’s no good reason not to band together. 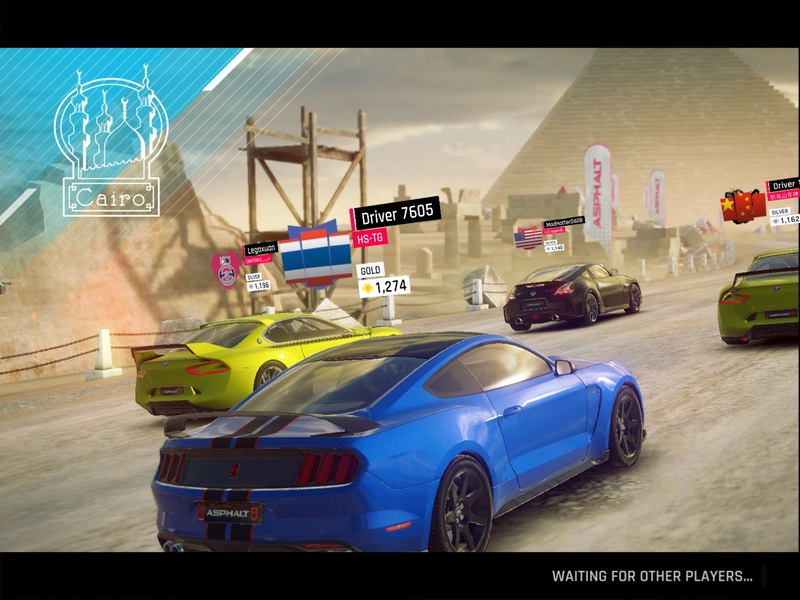 Try your hand at Multiplayer: Asphalt 9 offers live multiplayer racing with up to eight players per race, with all the bells and whistles that you’d expect: leaderboards, a ranking system and seasonal rewards among them. However, even if you’re complete pants at PvP racing, you can earn up to three different packs of blueprints per day simply by attempting multiplayer races. The key is either to “git gud" and win races, since you’ll earn three cups for a win, but you’ll get one cup just for playing (and two for coming in second, which we also like to call “first loser"). Earn enough cups in an hour and you’ll get that free blueprint pack. Open card packs in the Shop: The shop will give you a free pack of blueprint cards every four hours — and unlock some mobile games, they don’t stack, so checking in every four hours is the way to go here. You can also spend your premium currency, called Tokens in this game, for Premium Packs that have an additional chance at rare cars. You can also get less rare cards, because gacha. 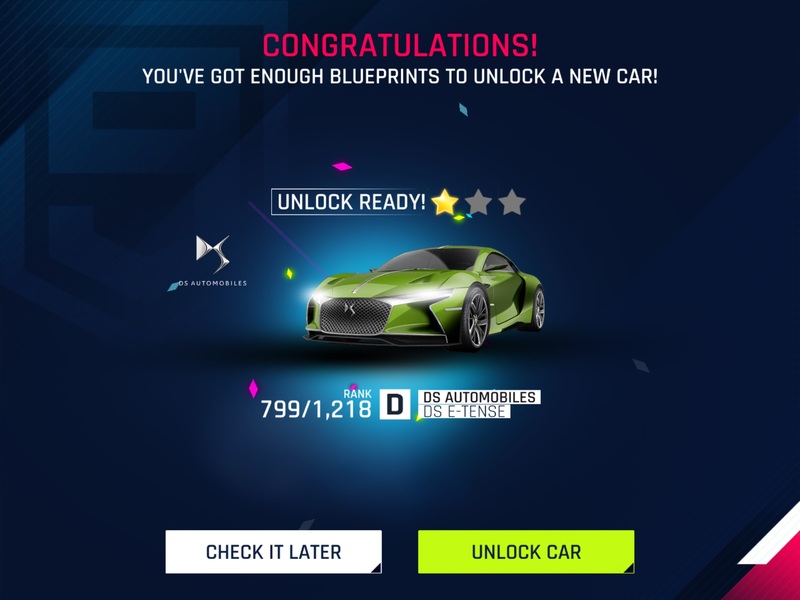 Either way, even more common blueprints can be helpful for ranking up the cars you unlock in My Career, so it’s worth saving up 65 Tokens when you’re able. Cherry pick individual blueprints in the Legend Store: Adjacent to the card packs in the Shop is the Legend Store, which offers a rotating selection of car blueprints every few hours. Some you can buy for credits (a lot of credits), others will cost you Tokens. The trick here is that you need to spend more currency for each successive blueprint, so it’s not very cost effective for more than the first one or two. Still, it’s an option that’s out there for you. There should be much rejoicing at the fact that Asphalt 9 does not have an overarching energy system that controls how much you can play in one session. What it does have, though, is in some ways a bit worse, because each car in your collection had its own separate supply of gas, which tops out at six units. That means you can only play six races with any given car until you either wait for the gas to refill or take action to get more right away. You have multiple options for doing the latter. The first is to speed up the time you need to wait by paying Tokens, or, since we’re trying to keep it free here, by agreeing to watch ads. Depending on the length of the refill time, you may have to watch more than one ad, but whenever you’ve satisfied the requirement, your entire fuel tank gets filled, so it’s not all that bad, all things considered. If all the vehicles in your garage are running low on gas, the thing you’ll want to try to do is rank up your reputation, as each time you level your profile up, you get a fuel refill for every car, no matter how many you own. Obviously, this is a pretty nice reward, and since you get reputation points for literally every race you enter, solo or multiplayer, you’re constantly working on this at all times. Since credits are needed for every performance upgrade you make to any car, you’re never really going to have enough of them. The more cars you have and the better they become, the more pronounced this need will be, as every level of upgrade carries a higher cost. Fortunately, you get credits with every race you run, but there are ways to speed up your earning power. The first thing to look for is My Career races that have multiple goals. Every goal you hit in a race earns you a flag, which can help unlock more solo seasons, but beyond that, every one also carries a credit reward. Knocking out three flags in one race brings three times the credits, so prioritizing those races is a good idea. While you are in My Career, make sure to check out the map of your current season as there are occasionally nodes you will unlock that give you a quick infusion of credits. The other place to earn some quick faux cash is in Daily Events, where you will see races for each class of car that yields credits as a reward. 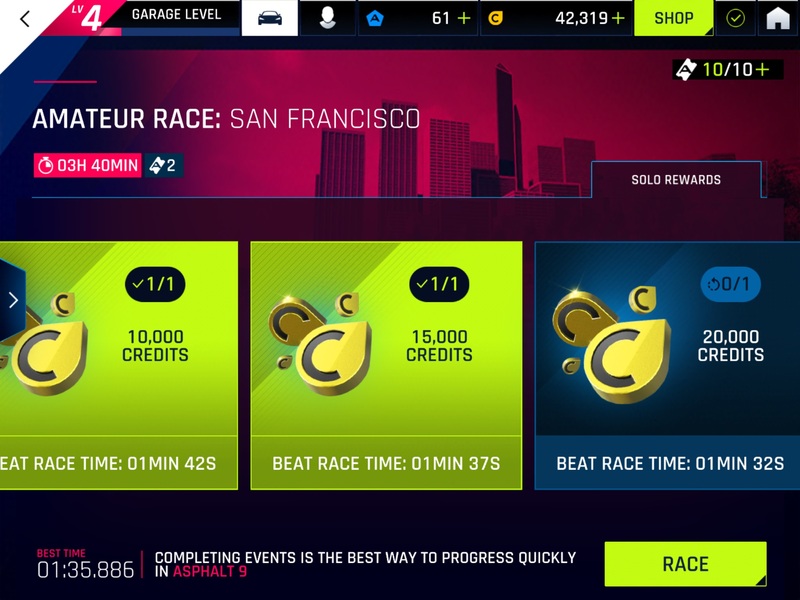 If you can beat the best target time, you can actually win yourself four different credit rewards from just one race, so it pays to have a car in each class that you have maxed out in terms of performance just for this reason alone.